I’ve been working to get all of my stories edited. Well, I’ve been working to earn money so I can pay someone else to edit them. Then I get to go through, approve most of the edits, then reformat, and resubmit to Amazon and everywhere else. The print book will also soon have the new cover, but it takes a couple days to go through the system. Forgotten Ones is the latest one to get this treatment. So I decided it needed a new cover to go with the new, updated insides. Something that really shows that it’s urban fantasy. This is the first time I’ve actually bought stock photos to use. I don’t think anyone else has used this particular photo, so that helps. And there are other shots of this particular model that I might pick up for the next book. I’ve just gotten the edits back for “Small Bites: The Complete Collection” and I’m working on getting those out in the kindle version. I’ll also be updating the four individual books at the same time. For the print version… I’m working on something totally new with full color pages inside, a smaller binding, and basically totally awesome! This is going to take a little time because there is so much to go through and fix. I won’t be doing this with any other books right now. I’m still busy finishing my novel, and once that is finished I might look into updating a few other books. Hopefully, I won’t ever send a new thing to print/kindle again unless it’s been edited first. I’m getting better at editing myself, but it’s going to take time to get my self editing up to a good standard, and even then I still want an extra set of eyes to go over everything. So far my new editor has been incredible, and it’s so great to find someone I can work with, who get’s my writing, likes it, and knows how to make it better. “Forgotten Ones” is finally here! It is on Amazon for $2.99 for the weekend. I will also have it on Kobo soon. A print book should be available by Nov. The story of the goddesses of Fate in the modern day, fighting to save humanity from one of their kin. This felt like it took a long time to me, but I realized this is actually the fastest I have ever completed something this long. Three months, 30,000 words. Not only written, but edited, formated, and covers done. Start to finish, less then three months. I’ve done NaNoWriMo before. A hot sweltering mass of words tumbling out across the page. 50,000 word rough draft to show for it at the end. I’ve done it, several times. But those are drafts. Incomplete. Unviewable by the general public. It took me another three months, after writing them, just to do the rewrites. Once I completed “Forgotten Ones” my boyfriend showed up at my door with a dozen red roses, and a platter of sushi. If that’s what I get for finishing a short book, I can’t wait to see what I get when I publish a full length, 100,000 word epic novel! As for the next book, I am hoping to get the two short stories I’ve been working on finished, and published, soon. One is a halloween story, and should have been up at the beginning of the month, so we’ll see. 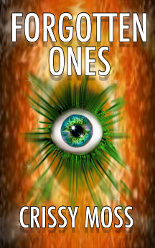 For NaNoWriMo, starting Nov 1st, I will be working on two, or three, of my paranormal romances. They will probably be 30,000 words each, that’s why I’m doing two. The best part about all of this is just finishing something, and being that much closer to a full time writing career… oh, and affording an editor to re-edit everything. That will be nice too.